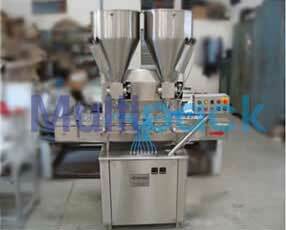 Automatic Cream-Lotion Filling Machine works on volumetric principle with rotary valve type piston. The unit is made compact, versatile and enclosed in stainless steel elegantly matt finish body, of S.S Slat Conveyor, with self-cantering devices & Stainless Steel Piston. The main drive of the machine and conveyor drive consist of A/C Motor with synchronized variable A/C Frequency drive. Machine fitted with, rotary valve and is suitable for dispensing, lotions and Jellys. Accuracy is ±1%. Automatic model, containers moving on conveyor belt lifting of container at filling station to ensure proper layer of, jelly, ointment or Jelly. It features an in feed hopper, rotary valve with positive shut-off nozzle (eliminating drips), stroke limitation fill volume adjustment, and is designed to stand alone. Construction is of Stainless Steel and the control system is pneumatic (3.5kgf/cm square) and electric (Four phase) over air. Containers moving on S. S. Slat conveyor, feed below the filling nozzles through a settable twin pneumatically operated valve system. The twin pneumatically operated stopper system and can precisely match for centring of container below nozzles, to avoid spillage of Cream-Lotion on container.